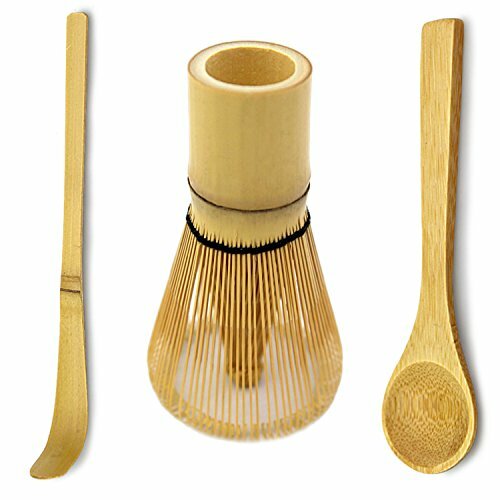 This Bamboo Whisk (Chasen), Hooked Bamboo Scoop (Chashaku) and Small Bamboo Spoon set for preparing Matcha green tea are the traditional tool is used to prepare the perfect cup of Matcha green tea. Use it by whisking in a zig zag motion until frothy, and it will give the Matcha tea a smooth and frothy consistency, and heighten the matcha tea experience. Whisk is about 4" tall & 2.3" at it widest. Handle is about 1" wide. The Chasen (Bamboo Whisk) comes in a clear tube for storage and display. This bamboo whisk + scoop & spoon set is perfect for your complete matcha tea collection and will help you make the perfect cup of tea. Whether used for your tea ceremony, or for everyday use, you will be impressed with the quality of the MatchaDNA brand bamboo whisk + scoop and spoon. Get Your Bamboo Matcha Whisk Today & Start Enjoying Matcha Tea Prepared In The Traditional Tea Ceremony Way. HEIGHTENS YOUR MATCHA TEA EXPERIENCE - Bamboo Whisks and Scoops are the tools used in the Traditional Japanese Tea Ceremonies.